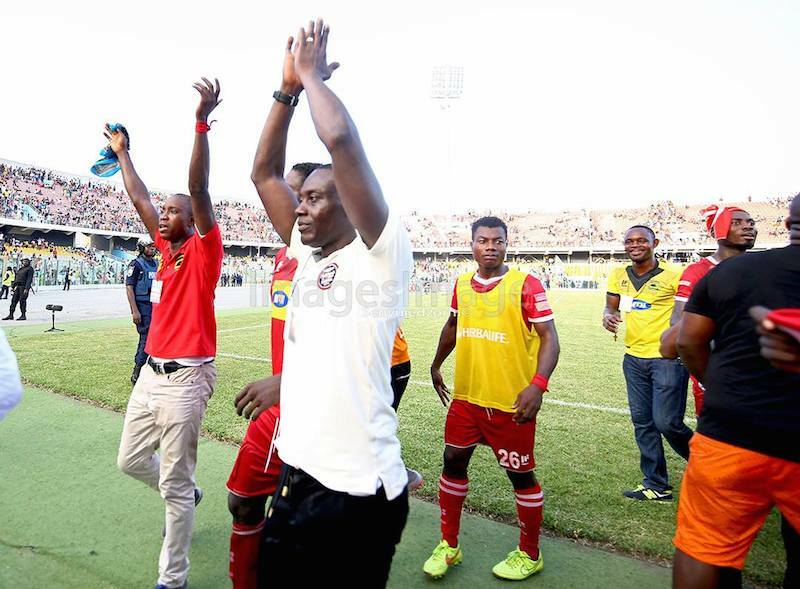 Asante Kotoko head coach, Michael Osei, has hailed the standard of play in the Super Clash with Hearts of Oak despite sharing the spoils at the Baba Yara Sports Stadium this afternoon. Speaking after the game to Supersport, Michael Osei lauded both teams insisting their level of play was tactically excellent. Asante Kotoko took the lead in the first half through Kwame Boateng’s strike after Soulama saved a Sarfo Gyamfi 25-yarder shot but Patrick Razak connected excellently through Isaac Mensah’s tailor-measured pass to cancel the score to restore parity. Still, Michael Osei says he is highly impressed with the level of play. “I am not happy that we didn’t get all the three maximum points but I can say that I am hugely impressed with the standard of play this afternoon. “Of course, these are the two biggest sides in Ghana and I must accept that the level of play is great in this game,” he added. Hearts of Oak tops the Ghana Premier League with 38 points, five points more than their bitterest rivals, Asante Kotoko, in fifth place on the table.